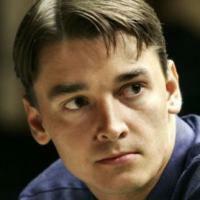 The blitz tournament appetiser for the 2012 Tal Memorial was won by Alexander Morozevich, who scored 6½/9 points. Morozevich took the €5,000 first prize on tie-breaks from Magnus Carlsen thanks to his victory over the world's #1 in their individual game in round 7 (Carlsen lost on time). The positions in the blitz tournament decide the pairings for the main event, with the most significant point being that the top five will have 5 games with white (and 4 with black), while the bottom five have 4 games with white (5 with black). Although this is a slight disadvantage for the bottom half of the field, the first tie-break if there are tied scores in the main competition is highest # of games with black, so it could work in their favour in some circumstances. Games are available for replay at this page of the official coverage. The full live video coverage is available for replay here, or divided up round-by-round here. The serious business gets underway tomorrow (8 June) at 15:00 local time in Moscow (11:00 UTC). Full schedule and more details in our previous news report. The pairings in round 1 are: Morozevich v Caruana, Carlsen v Kramnik, Grischuk v McShane, Radjabov v Tomashevsky, and Aronian v Nakamura. Screenshot from the live video coverage.